A full-scale space shuttle solid rocket booster is fired in Utah to conduct 76 test objectives, including a modification that slightly changes the shape of the propellant in a segment of the motor. Ride along with Oppportunity as the rover drives into and back out of Endurance Crater on June 8. MOJAVE, Calif. - A privately-built rocket plane soared into space today, boosting a 63-year-old test pilot on a thrilling, at times scary ride out of Earth's discernible atmosphere and into history as the first non government-sponsored astronaut. The successful voyage sets the stage for a possible attempt later this summer to win the coveted Ansari X-Prize, a $10 million award that will go to the first team that can launch a privately developed, manned craft on sub-orbital flights to space twice in two weeks. But SpaceShipOne, funded by Microsoft co-founder Paul Allen and built by legendary aircraft designer Burt Rutan, will not fly again until Rutan's team of pilots and engineers figures out what triggered the failure of a critical flight control system during the climb to space. "There is no way we would fly again without knowing the cause and without assuring we have totally fixed it because it's a very critical system," Rutan told reporters later. He called it "the most serious flight safety systems problem that we have had in entire program." Based on a preliminary analysis of flight data, engineers believe a component called a trim actuator failed, causing the sleek rocket plane to suddenly roll as it streaked through the extreme upper atmosphere. Pilot Mike Melvill quickly activated a backup system that "saved the day," but by the time the roll problem was corrected, SpaceShipOne was off course. It re-entered the atmosphere 22 miles from its planned 5-by-5 mile re-entry zone. The malfunction also reduced the efficiency of the climb to space, preventing SpaceShipOne from reaching its planned altitude of 360,000 feet, or 68 miles. 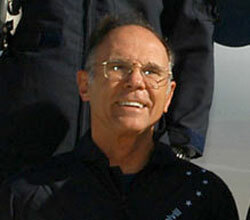 Instead, Melvill climbed to 328,491 feet, or 62.214 miles, Rutan said, just a few hundred feet above the altitude considered to be the edge of space. But that was enough to earn Melvill his commercial astronaut wings from the Department of Transportation and recognition by the Guiness World Records organization as the first privately funded manned spaceflight. And it was more than enough to convincingly demonstrate that relatively low-cost access to space is no longer the stuff of science fiction. With an investment of less than $30 million, Rutan built, tested and launched a true spacecraft in just three years. But the trim actuator malfunction and another unexpected roll excursion just after motor ignition also demonstrated anew that spaceflight is a risky business and that the margin between success and failure can be slim. "It was not a nominal flight," Rutan said at the beginning of a post-flight news conference. "The altitude that I indicated we would probably go to yesterday, we didn't go to. "It was no big deal in terms of safety and no big deal in terms of getting it back to the runway we like to land on. But it was not a smooth flight from the standpoint of trajectory. The good news is that even though we were that far off and even though we had some issues in the early stage of the boost, which meant that we weren't flying as efficiently, we did get there. Small margins, but we got there." All in all, it was a triumphant moment for Rutan, Allen, Melvill and the small cadre of engineers and pilots at Rutan's company, Scaled Composites, who worked around the clock in relative obscurity to build the first commercial spacecraft. "It was very exciting," Melvill said. "I must say, I wasn't scared, I was a little nervous when I got in the airplane, but I was not afraid all the way up. But I was a little afraid on the way down. Boy, when you re-enter at 2.9 Mach and you start hitting the atmosphere, the noises you hear are somebody talking to you very, very sharply. You know, you begin to believe, wow, should I really be doing this?" But in true right-stuff fashion, Melvill adroitly handled the roll problems and took a few moments to enjoy the view and three-and-a-half minutes of weightlessness as SpaceShipOne arced over the top of its trajectory before falling back to Earth. "The sky was jet black above and it gets very light blue along the horizon," he said. "And the Earth is so beautiful, the colors of the Earth, the colors of the high desert and along the coastline and all that fog or low stratus that's over LA looked exactly like snow, the glinting and the gleaming of the sun on that low cloud looked to me exactly like snow. "And it was really an awesome sight, I mean it was like nothing I've ever seen before. And it blew me away, it really did. ... You really do feel like you can reach out and touch the face of God, believe me." Like all rookie astronauts, Melvill couldn't resist a bit of fun with M&Ms in his brief moments of weightlessness. After firing small gas thrusters to stabilize the craft, "I reached in my pocket and I took out some candy coated chocolates, all different colors, and let them go in front of my face," Melvill said. "And they just spun around like little sparking things. And I was so blown away, I couldn't even fly the airplane. I got another handful and threw them out as well." "We were trying to talk to you and never heard an answer," Rutan broke in with a smile. "Yeah, right," Melvill replied. He then noted for the record that M&M candy "doesn't melt in your hand but neither does it melt in space." Peter Diamandis, chairman of the Ansari X-Prize board of trustees, hailed the flight as the dawn of a new era in space travel. "It's an amazing day and a real tribute to the Scaled team, Paul Allen, his entire organization," he said. "Of course, this is a warm up for the Ansari X-Prize from one perspective, but a historic event for all Americans, all entrepreneurs, to everyone who's ever dreamed and had passion to go into space from the Earth. "This is something that should have happened 20 years ago and thank God it's happening, finally, today." 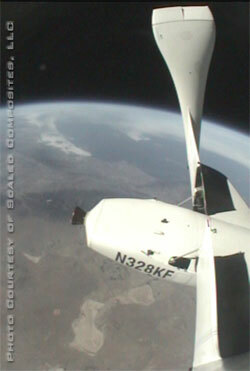 America's government space agency - NASA - congratulated Rutan, Allen and Melvill after the flight. Astronaut Mike Fincke, orbiting aboard the international space station, was told about the launch by mission control in Houston. "Fantastic!" he replied. "We were wishing him the best of luck. We're all in the space business together, helping mankind get off the planet and explore the stars." Said NASA Administrator Sean O'Keefe: "We applaud the remarkable achievement of Burt Rutan, Paul Allen and test pilot Mike Melvill following the successful sub-orbital flight of SpaceShipOne. ... These private citizens are pioneers in their own right." The mission began shortly after dawn in California's high desert, after blustery winds died down at Mojave's civilian airport. Tens of thousands of spectators turned out, along with hundreds of reporters and photographers, to witness the trail-blazing flight. Acknowledging the crowd, Melvill opened a small window and waved as SpaceShipOne, slung below the Rutan-designed White Knight carrier plane, taxied toward the far end of runway 30. "When we taxied out, I was absolutely in a state of shock at the amount of people standing along the fences screaming and yelling and waving," Melvill said. "But it was great, you know, it makes you feel good, it makes you feel like you're doing something people are interested in and I'm just thankful that we were successful and everybody enjoyed the day." As always during a test flight, he was wearing his lucky horseshoe, a piece of jewelry he designed and presented to his girlfriend when she was 16 years old. The two were married when she was 17 and have been together now for 48 years. Preceded by two chase planes, White Knight pilot Brian Binnie opened the throttles, raced down runway 30 and lifted off at 9:47 a.m. EDT (1347 GMT). Another chase plane, this one also a jet, took off a few moments later to document the high-altitude portion of flight. Climbing slowly away, it took White Knight about hour to reach the planned drop point 46,000 feet above the sun-drenched airport. "When we took off from the ground with Brian driving the White Knight, there's very little for me to do at that point," Melvill said. "It's a pretty lonely time, actually, not too many people talking to you and you're sitting there with a lot of thoughts in your head, wondering if everything is going to go smoothly." But the action picked up as White Knight climbed through 43,000 feet and Binnie started calling out checklist items to prepare SpaceShipOne for launch. Melvill adjusted the craft's roll, pitch and yaw trim to ensure the proper orientation for rocket ignition and broke a copper wire preventing an inadvertent launch. 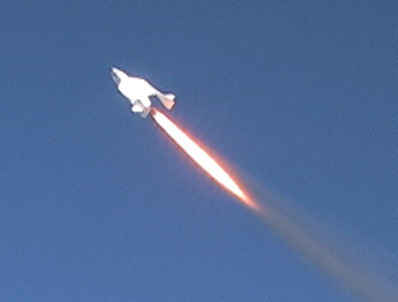 Then, after a short countdown, SpaceShipOne dropped away from White Knight at 10:50 a.m. EDT (1450 GMT). "I was ready to go," Melvill said. "When I dropped off, I instantly unguarded both switches. I hit the arm switch, hit the fire switch and sat back and waited. It takes about maybe a second, 1.2 seconds, and it lights off." SpaceShipOne's hybrid motor was loaded with enough rubber fuel - about 600 pounds - and enough liquefied nitrous oxide - 3,020 pounds - to boost the ship to an altitude of 420,000 feet, or 79.5 miles. The actual target of 360,000 feet was set as part of Rutan's incremental approach to flight testing a new craft. At motor ignition, Melvill was slammed back with 3 Gs of force. At the same time, he was plastered down into his seat with 4 Gs, "which is very, very disorienting. You feel like you're falling over on your back and you have to guard against that. And then I follow a predictor that's on (a cockpit) display that leads me up." With the rocket firing, he said, "we're really hauling the mail. You get the feeling that if you did anything wrong there, you might really hurt yourself. So you're paying attention about as strongly as you possibly can to keeping things perfectly true and upright. "There's a lot going on and it all happens in a very, very short space of time. So it is difficult to do. And it couldn't be done without the comprehensive training that we do. We go through hundreds and hundreds of simulations. I mean if somebody, even a good pilot, jumped in that thing he would be instantly dead if he lit the rocket. Instantly." Melvill's long hours of training paid off when "there were a couple of things that happened that were unusual compared to the last flight." "This time, right after I lit the motor, the airplane by itself rolled 90 degrees left. I stomped on the rudder pedal and put in some control and it rolled 90 degrees right. And it's never, ever done that before. So at that point, I was kind of reaching for the switch to shut (the engine) down in case I was going to lose control. But I was able to get it back, get it leveled up and started trimming the nose up to pick up the proper gamma, the angle of climb, which is nearly to the vertical. "Then it was pretty smooth ride after that," Melvill continued. "Then when the engine runs out of liquid fuel, it starts using the remaining gaseous fuel. So you get this chugging feeling where its using some liquid, it's using the gas, it's using some liquid. So you get a lot of thrust and then half the thrust, then a lot of thrust. So that's a bit disconcerting because the airplane pitches a little bit when it's doing that and you've got to try to deal with that. "Then right up at the top of it, I tried to trim the nose up a bit more to just get a little more height and that's when I had the anomaly with the trim system and then I had to deal with that through the backup." When flying below the speed of sound, pilots control SpaceShipOne by moving a conventional "stick" that repositions the craft's elevons. But in supersonic flight, "you can no longer move the stick, it's like it's welded to the airplane," Melvill explained. "So I have to fly it using pitch, roll and yaw trim and I had a roll trim problem. We had a backup for that system, I went to the backup and the backup saved the day." Rutan said the trim system used on SpaceShipOne is similar to systems used routinely by Lear jets and commercial airliners. "But the failure of trim on an airliner or a Lear jet, if it sticks there, in general you can fly it back and land safely," Rutan said. "In this case, we have one on one side and one on the other side and so if they get out of sync, then you're out of control in roll rather than pitch. So it's a little more sensitive and that's why we have these backup systems." He said his team of engineers will be "very careful taking the ship apart to make sure we don't cover up something by not studying it properly. "But we believe that we lost one of those trim actuators, like it became inoperative, which means when we tried to trim in pitch, we got a lot of roll going," he said. "While Mike was in space, he took the other one and leveled it up so that during re-entry we would not be out of trim in roll." For re-entry, Melvill also feathered SpaceShipOne's wing, rotating it to an angle of 65 degrees with respect to the fuselage of the spacecraft. A Rutan innovation, the feathered wing creates enormous aerodynamic drag, causing the rocket plane to make a "care-free" re-entry that doesn't require a precise angle of attack. The feather system worked flawlessly and Melvill said "I headed back to Mojave as fast as I could reasonably fly the airplane without hurting anything." "It was very comfortable," he said. "The descent after that was great except I had no use of the trim system. It may have worked, some of it may have worked, but I was afraid to touch it. So I just flew with the trim setting I had at the time. And the landing was pretty uneventful." 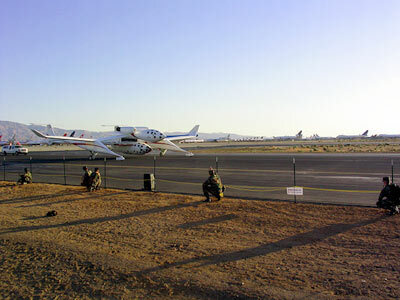 Rutan and Allen, who monitored the mission from "mission control" in a Scaled Composites hangar, were waiting for Melvill on the runway as SpaceShipOne glided back to the same runway it used for takeoff, touching down at 11:14 a.m. (1514 GMT). 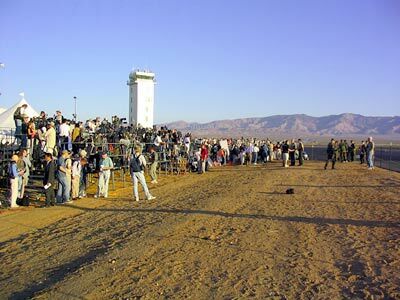 The rocket plane was towed to a viewing site on a taxiway just in front of reporters and Melvill promptly climbed out. After hugging Allen and Rutan, Melvill told reporters "it was a mind-blowing experience, it really was, absolutely an awesome thing." Buzz Aldrin, the second man on the moon, also was on hand to greet the new astronaut "and to have him come up and shake my hand and congratulate me and tell me I'd joined the club, that was serious stuff, man," Melvill said. Rutan said a loud "bang" heard by Melvill during his sub-orbital flight may have been caused by the crumpling of a thin fairing near the rocket motor's exhaust nozzle. Today's flight marked the first use of a larger nozzle and the fairing was intended to provide a very slight improvement in aerodynamics. The crumpled fairing was not considered a serious issue. But analysis of the roll control problem likely will take several days. 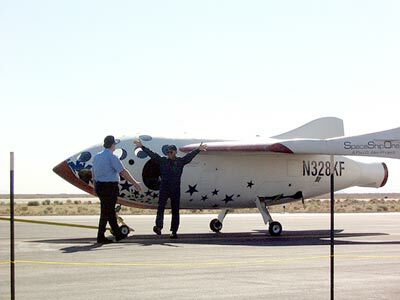 Rutan said he originally intended the next flight of SpaceShipOne to be the first launch in an attempt to win the Ansari X-Prize. "We'll be looking at the data, we'll be looking at all the issues for the X-Prize attempts," he said. "When we go out for the X-Prize, we'll probably fly two flights within a week. ... So I would say in the next several days, we'll make a decision and then (inform the X-Prize organization) and that kicks off a 60-day clock at which point they'll announce to you when the time is. "The only thing is, it can't happen any sooner than 62 days (from now)," Rutan said. "But if we decide we have a big safety issue with this actuator, for example, that may delay us until we can get it fixed. This was not a perfect flight. Then again, a lot of these things you can do within a 60-day window and easily fix them."